Feeling overwhelmed when issuing orders and constantly sending faxes or emails to your counterparties? Searching databases and filling forms consumes a lot of your time? We have good news for you. The new module for quick issuing of transport orders is already available in the Trans.eu System. Now, you can send orders with just one click. Everything else is automatised. TransOrders – new in the Trans.eu System. A great solution for quick creating and sending transport orders, useful mainly for smaller freight forwarding companies not using a dedicated software for managing orders and shippers who work directly with carriers. Also carriers will appreciate the service. It allows them to provide counterparties with current status of order execution. To accept or issue an order in Trans.eu, you do not need to make multiple calls, look through spreadsheets or send documents by fax or email. The entire process is held in the Management Panel and it takes only a moment. We were inspired to create the new module by the needs of our Customers. Our goal was to simplify handling orders to the maximum, save their precious time and make their work easier, also allowing them to adapt the tools to their needs. Our efforts resulted in the intuitive module that allows for issuing a transport order based on the data from the offer, thus shortening the duration of handling of the entire process. The tool also allows for saving your own order templates and conditions of transport. The entire documentation of the issued orders is created automatically and is marked with the Customer’s company logotype. 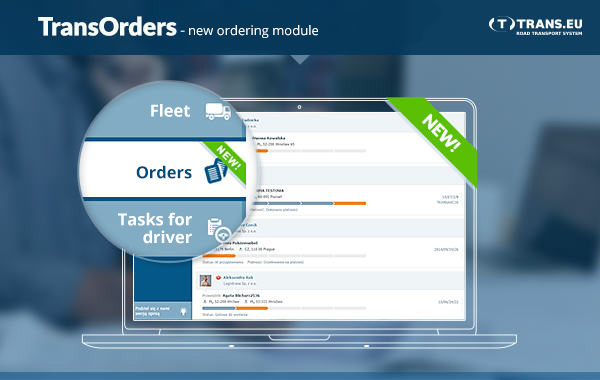 The transport orders module is available free of charge for the Trans.eu System subscribers. We believe that our Customers will like it and will use it to issue orders within the system as well as in everyday cooperation with their counterparties outside Trans.eu. Thanks to this tool, they can manage all their current and previous orders in one place.